On behalf of the President of the Aberdeen Society of Architects, we are delighted to invite our members and their guests to the Society’s Annual Dinner & Awards Ceremony, which will be held on Friday 23rd February 2018 at the iconic Elphinstone Hall in Old Aberdeen. 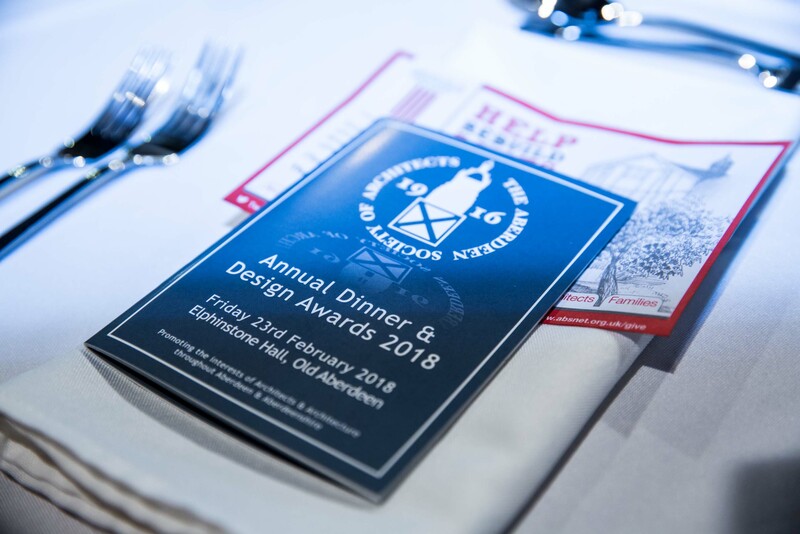 The Dinner marks an important social event in the Aberdeen Chapter’s diary and will again incorporate the presentation of the ASA’s Annual Design Awards. We are delighted to announce that our Keynote Speaker this year will be Richard Murphy OBE FRIAS RIBA. Amongst many accolades, of late his practice has received the 2017 RIAS Doolan Prize and the 2016 RIBA House of the Year. Bookings from both RIAS Practices who wish to host tables, and individual chapter members, are most welcome – we do hope the evening will be strongly-supported by our local membership. As you will note from the Reservations Form, we require your completed bookings and full payment no later than 5pm on 7th February 2018. This is a condition of the contract we have entered into with the venue and to complete planning of the evening – we would be very grateful for your co-operation with this in order to make the event a great success, and to avoid any disappointment. Please note that following confirmation of your booking, further details will be issued to you. We very much look forward to welcoming as many of you as possible for what we are sure will be an enjoyable evening. Please do not hesitate to contact Richard Slater (social@aberdeenarchitects.org) or Sheila Riddell (sriddell@supanet.com) if you require any further information. ASA Design Awards 2018 Shortlist! ASA Design Awards 2018 – Judging begins!